Anyone can stumble, slip and fall. It can happen in the street, in a shop, a museum or a restaurant, in a pool, fitness room or in any other public place. It can occur in the summer and in the winter, in the spring and in the fall. It could happen because of a banana peel thrown on the street, or an ice-covered road which was not sanded, or just the freshly washed up wet floor. It is possible to fall off of stairs and, even, on a flat surface. 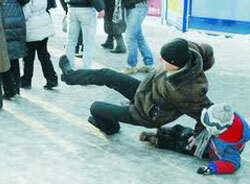 The result of Slip & Fall Accidents can be not only bruises, but also very serious damages. It can be various head injuries as well as neck, back, and thorax traumas, etc. Unpleasant consequences of such injuries may not appear immediately, but after some time in the form of lack of coordination, a hearing disorder, blurry vision, headaches, dizziness, insomnia, or back pain. If a Slip & Fall Accident has happened to you, your relatives, or your friends, urgently call SLOMYANSKI LAW at 416-519-1006, or send a fax to 647-340-2899, or complete the form on our website in order to get a free consultation. You pay only after you receive compensation.